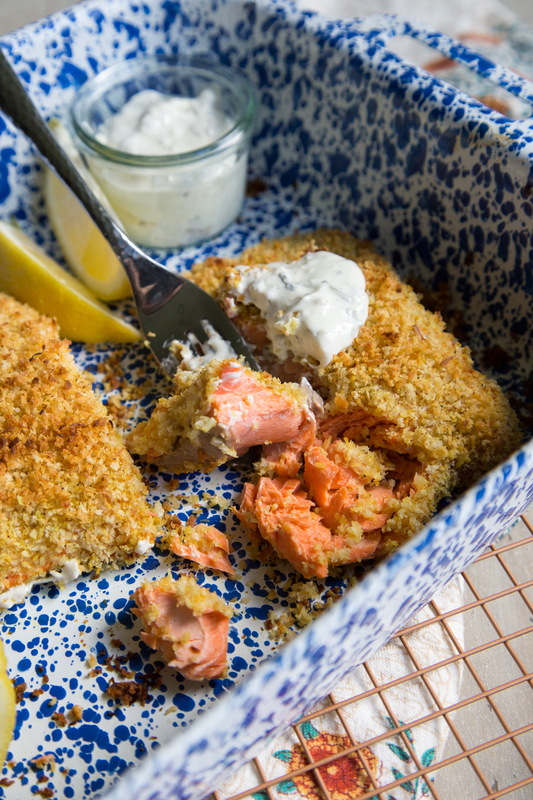 Salmon season is coming up and you will want to keep this recipe for coconut curry crispy baked salmon handy for when the first wild fish arrive!! 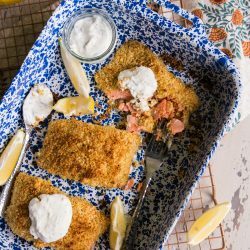 Use wild salmon filets for this easy recipe that has crispy coated panko and coconut with a dash of yummy curry! And the tartar sauce dressing isn’t one to skimp on either! Last week I did a quick informal poll on the ol’ Instagram stories to see what you guys were really craving and wanting out of the blog! It was definitely a good surprise to know what you loved and what you wanted to see more of. One of the most relieving answers was to the question I asked about Emmett! I know not everyone is a “baby person”, so I was getting worried I was showing off TOO much Emmett and that it would be the mommy goggles that made him so irresistibly cute to me, but might be making your eyes roll. That was until 99% of you guys said “MORE EMMETT”. To the 1% who said “No more babies, all they do is scream”, I hope I can find something else to entertain you. But I will definitely be giving the rest of you what you want – MORE EMMETT. HA! Boy am I glad you guys all love him as much I do. As the happiest baby on the planet, it makes me happy that he makes you happy, too. But there were other things you guys wanted more of and on that front, I am happy to oblige there, too. Being a lover of cast iron, an overwhelming number of you, 75% said you wanted more cast iron recipes. Well, OKIE DOKIE! I’ve got one coming at you later this week. The others 80% of you said you’d rather have healthy over sinful. That one surprised me a bit, but as I am learning to navigate a new eating strategy myself in this post-mom world, it made me excited that what I am trying to do in my personal life will resonate with you guys, too. We can get healthy together! And then 95% of you said you wanted more how-tos! A couple of years ago, I did a whole series on how-to’s that I thought would be handy, and they helped me learn a lot too! But they kind of fell off, as I thought no one was paying attention to them, or really liked them. How wrong I was! So I’m going to start doing some brainstorming and see which how-to’s I haven’t covered yet. Be sure to see my whole category on how-to this far! There really are some good ones that I use to this day! 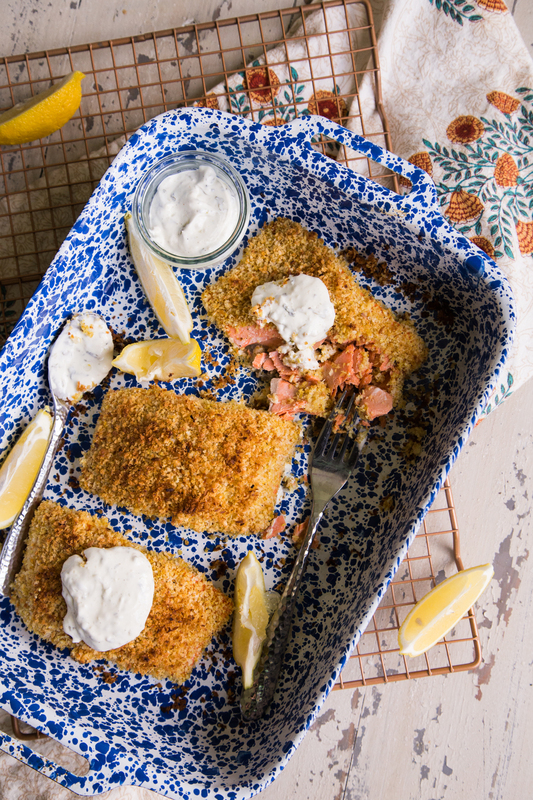 So with that, I am covering the healthy recipe request today with this coconut curry crispy baked salmon. I love that this is a dish that is done in 30 minutes, is beautifully cooked with wild salmon, and that has a good curry flavor without overwhelming the fish! It’s a weeknight meal miracle people. And the ginger garlic cilantro tartar sauce can’t be beat. I promptly wolfed down an entire filet as soon as I was done with these photos. And any leftovers will make a great topper on a summer salad! Preheat oven to 425 degrees. Prepare a baking dish by spraying it with non stick spray. In a small dish, stir together the curry, garlic powder, salt and pepper. Set aside. In a bowl, whisk the egg with the water/or milk. Set aside. In a non-stick skillet over medium heat, add in the olive oil and panko. Stirring frequently, toast the panko until it starts to turn golden brown. Remove it and pour it onto a large plate with the coconut and curry powder mixture, and mix it together. Pat the salmon dry with paper towels, and dip into the egg mixture, then immediately into the curry coconut panko blend. Gently press the panko into the salmon, sprinkling on a few extra crumbs to make sure it is thickly coated. Place the salmon in the baking dish, and repeat with the rest of the salmon. Bake for 12-15 minutes (depending on the thickness of the salmon filets). While the salmon is baking prepare the tartar sauce. In a bowl, mix together all the ingredients for the tartar sauce and refrigerate until ready to use. 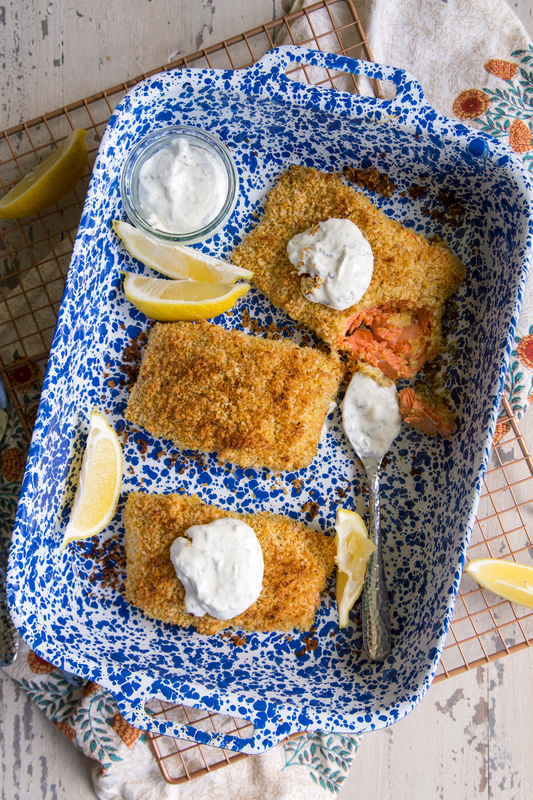 Serve immediately with salmon and tartar sauce.